When consolidating several equipment rooms into a single data center, the university sought a highly reliable, scalable and centralized UPS solution. 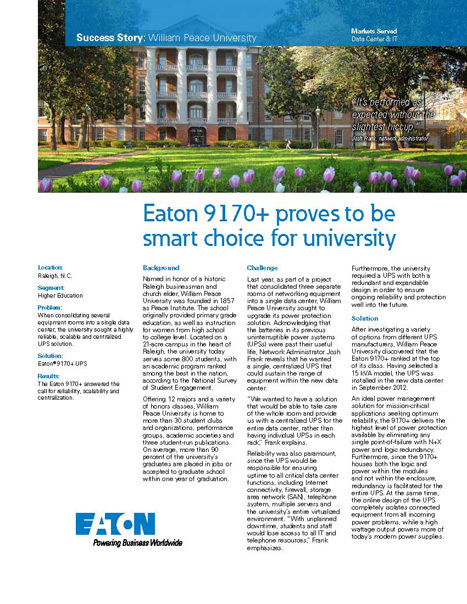 The Eaton 9170+ answered the call for reliability, scalability and centralization. The university sought to upgrade its power protection as part of a project that consolidated three separate rooms of networking equipment into a single data center. Reliability, redundancy and expandability were key factors in selecting the centralized UPS the school wanted. William Peace University installed the 9170+ in the new data center after discovering that the 15 kVA UPS ranked at the top of its class.